While many had predicted 2014 to be the year that the Television Industrial Complex imploded, very little actually happened in that regard. But here we are, more than a quarter into 2015 and BOOM!!! We can feel the girders of power beginning to crumble as the television ecosystem as we know it begins a tectonic shift. 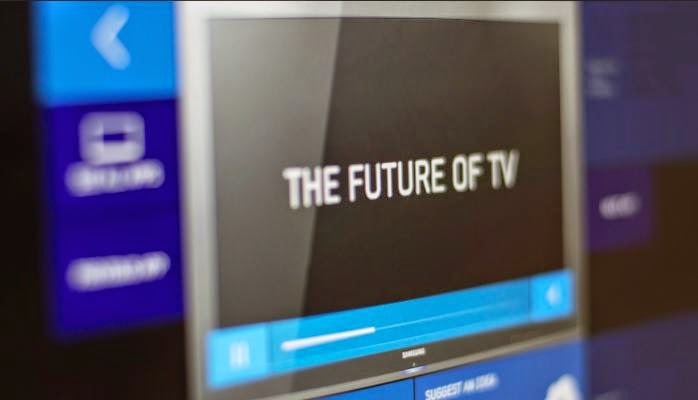 The Future of TV is happening NOW! RATM’s rallying cry is for the new generation to rise up and take control of the radio waves and drive the (r)evolution. We’re in the middle of a radical shift in thinking about TV, the airwaves, fandom, broadband and content control and access paradigms…it’s happening EVERYWHERE. This is not a (r)evolution from the inside, an ascension of the next generation. It’s a complete reconceptualization of the entire industry from the ground up. There was a new attendee at this year’s CES and that was SlingTV, the very first Virtual MVPD. For just $20 a month, Sling makes this idea of tv everywhere truly come to life, offering viewers a web-only TV package that will surely open the door for others to challenge the tyranny of the bundle, giving consumers more options and dramatically altering the business model of pay TV. A few hiccups have happened along the way, and their long-term success is far from guaranteed, but their launch has definitely put the industry on notice. Dish CEO, Joe Clayton explained that Sling TV is a “complementary service, not a supplementary service” aimed at the consumer the satellite provider hasn’t been able to sign on. So what? Well for one, ESPN. Viewers will no longer need a traditional cable package to watch the sports network. How many people are willing to dish out $20 bucks for ESPN ? TBD, but it’s a start and a major hurdle cleared for the “I’m on the fence about being a cord cutter, gotta have my sports” people that are contemplating the move. The reactionaries are pushing back though, stopping Sling from offering DVR service on most networks or even the ability to pause the current show. In the end, that may be more fatal than too much buffering. 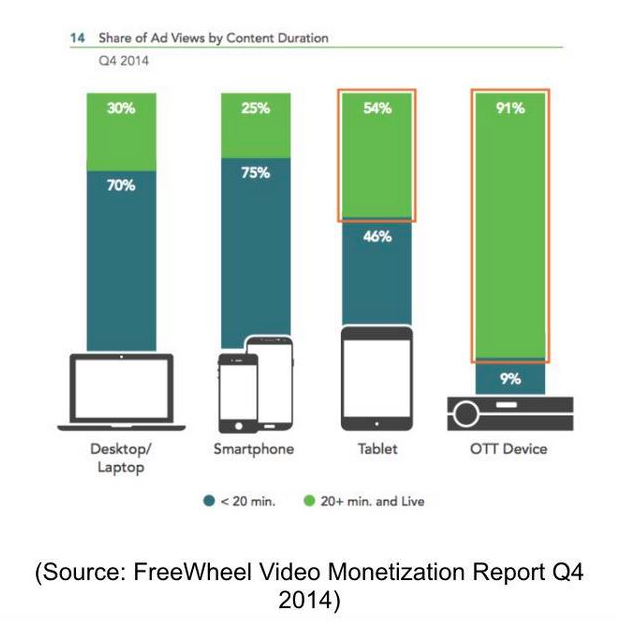 There’s a PLATFORM arms race happening here: thanks to the dramatic rise of online-video content. This year, domestic digital video advertising will reach an all-time high of $7.7 billion, a 30.4% increase over 2014. While YouTube has certainly provided a challenge to traditional TV networks, competitors are rising up to take on YouTube. Facebook is making the biggest push to dethrone the all powerful YT, launching native video, native AUTOPLAY video that’s gone from 1 billion views a day in September 2014 to 3 billion at the end of January 2015. Speaking of billions, Facebook is able to offer up their billion plus users and all the data they’ve collected about them to TV networks as a way to promote their new shows using (wait for it) their new autoplay video that’s the perfect size for a 30 second promo… which, now that MVPDs are allowing Facebook authentication, could actually allow for direct tune-in. Facebook’s new Anthonlogy initiative will allegedly pull together a passel of hot publishers— The Onion, Vox. Funny Or Die, Buzzfeed— and press them into service to create branded video content for advertisers, making the hoodie wearers a threat to both ad agencies and TV networks alike and further disrupting the entire freaking ecosystem. Is this the long awaited Tipping Point, the SIGN that everyone’s been waiting for that will herald an era of unprecedented peace and prosperity (or at least the unbundling of TV networks.) 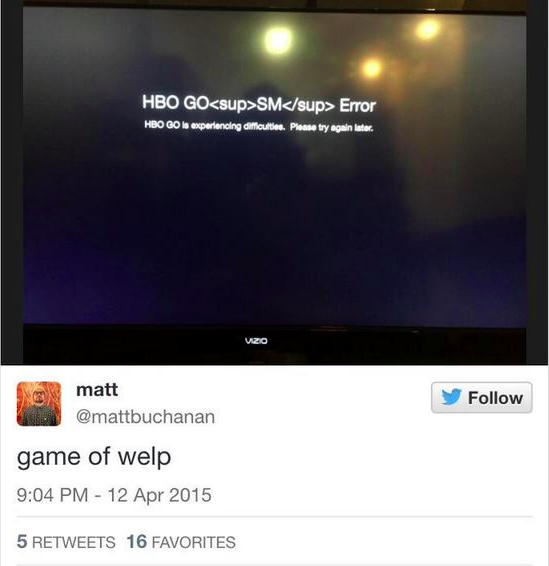 Is it just a clever way for HBO to get the upper hand in carriage fee negotiations with the MVPDs? 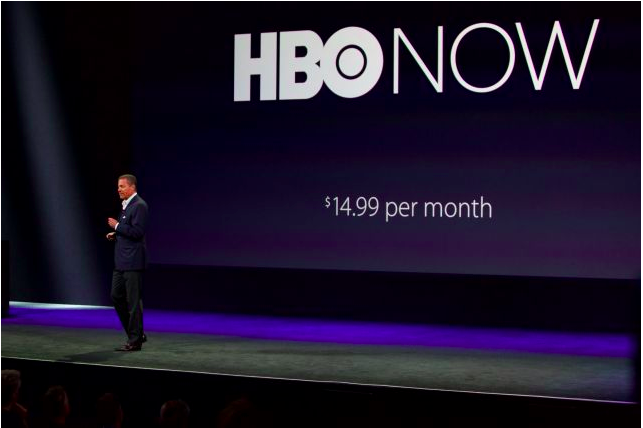 Or, as some are suggesting, a Trojan Horse for HBO’s upcoming assault on Netflix? The rapid rise of MCNs — and their powerful hold on millennials is rocking the entertainment industry as everyone from studios to talent to brand advertisers struggles to get a handle on how to handle this rapidly evolving beast and the stars it’s created, stars who have millions of followers who, as AwesomenessTV’s Cameron Dallas movie Expelled showed us, will buy just about anything their BAEs are in, even long form. Will this new world be ad supported, will it be subscription, how many subscription services will one person pay for, do I really want to auth into 7 different streaming apps, wait, why are there ads in my paid subscription service???? ARGHHHH!!! 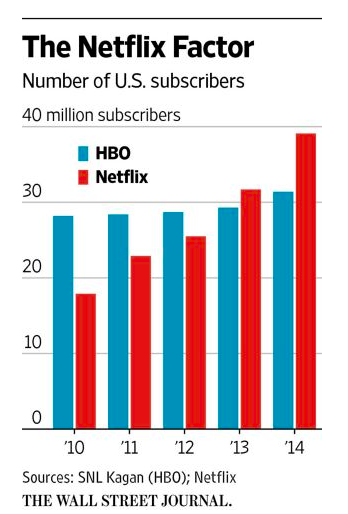 And there’s a TALENT and PRODUCT arms race going down: This year’s Golden Globe Awards confirmed that subscription services, whether on traditional cable like HBO and Showtime, or streaming, like Amazon and Netflix, have created a new home for the second Golden Age of Television, hosting the sorts of shows and fostering the types of performances that may not draw huge ratings, but have impact way beyond their reach. This points to the “art form” of storytelling entering a rapid ascension, for both networks and brands and the Modern Medici coat of arms being littered with never ending logos from the likes of Amazon, Netflix, GoPro, CBS and NBCU to Red Bull, GE and many many more to come. And Paranoia strikes deep: We’re also witnessing a sweeping plunge in live viewing, and the networks are quickly pivoting to keep up with the times. NBC’s head of research, Alan Wurtzel, opened the TVOT conference with a slide that showed that Prime Entertainment Time Shifted viewing for Q4 live linear viewing has slid to around 60% while noting that DVR Playback is not only largest primetime “network,” it’s four times larger than the other four major broadcast networks combined. That, and a new study from Freewheel showed that 64% of TV shows that are watched via OTT are watched more than 8 days from the original air date. In other words, there’s a whole lotta time-shifting going on. Which leaves everyone wondering how we measure all unruly activity. While the industry has been waiting for Nielsen to come out with their OTT TV ratings, they’ve been conveniently ignoring all the other metrics, primarily from social, that signal how much impact a particular show really has. WAKE UP PEOPLE. IT’S 2015. YOU CAN ACCURATELY MEASURE JUST ABOUT ANYTHING. And the industry needs to accurately measure everything (and then universally agree on the validity of those measurements) if all these new platforms (and old ones) are ever going to reach their full potential. Or at least get enough ad dollars in to continue to support production.